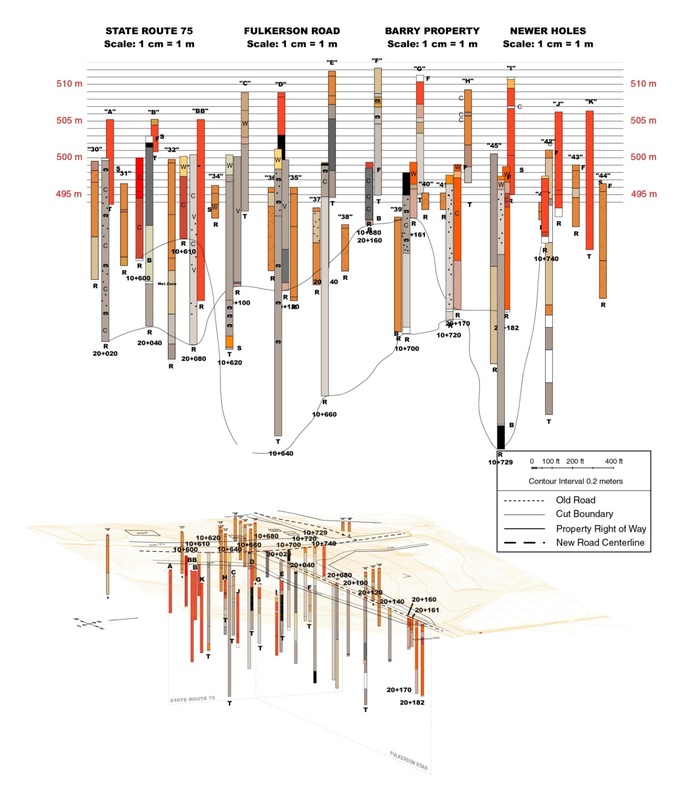 The stratigraphy is complex, and unfortunately, some of it is permanently gone. Most of the vertebrate material seems to lie in the dark layered clay, and dark clay with sand and gravel. These clays contain lenses and layers of angular chert gravel, with clasts of local dolomite. They had gravel beneath them along Route 75, and probably graded laterally into the gravels. Within the lower part of the dark clays are a number of large dolomite blocks. The dark clay and gravels overlie a thick horizon of gray layered clay. 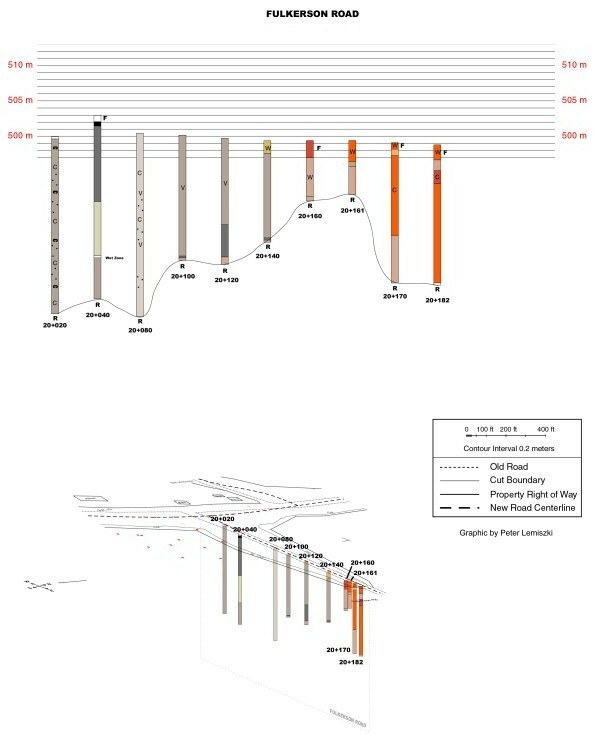 General impression of the stratigraphy, from various exposures around the site. Graphic by Martin Kohl from onsite observations. The possibility also exists that the "Alluvium" cap preserved on the southeast embankment is in reality the weathered extension of the dark gravelly layers. Layers above the dark clays but below the "Unconformity" are now missing. The Tennessee Department of Transportation drilled seventeen holes along the two planned rights of way, and twelve additional on the Barry Property, the remaining part of the hill south of the excavation. They indicated an area perhaps 700 feet long underlain by layered clays. 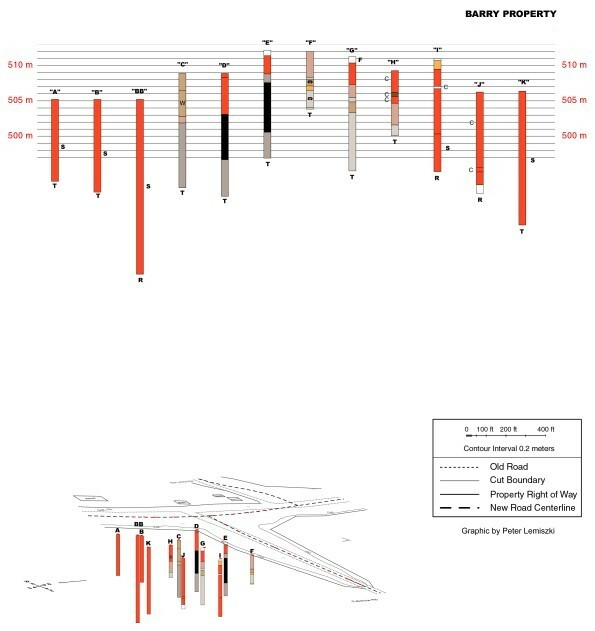 One drill hole indicated the presence of additional dark carbonaceous clay at depth, beneath the thick gray layered horizon. 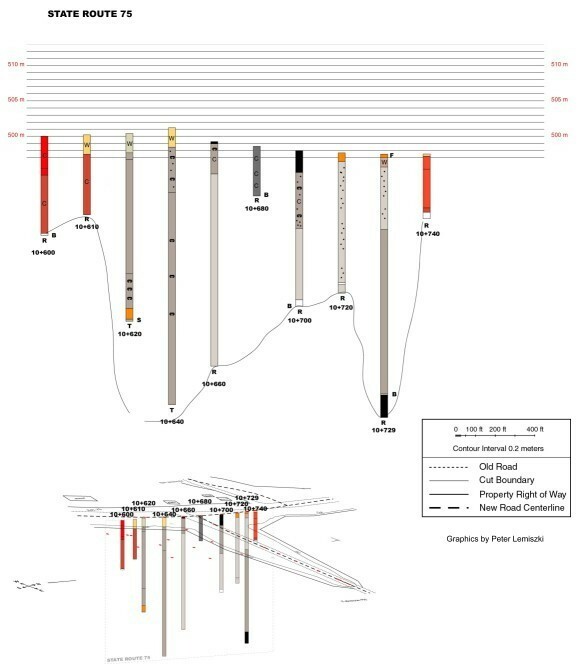 Information provided by the Tennessee department of Transportation, from on-site auger drilling logged by geologist Larry Bolt. Colors suggest color of material penetrated. Fill, recently emplaced during construction, usually reddish. Weathered, light gray or buff colored clay. Reddish soil or subsoil, residual. "Boulder" interrupting the progress of drilling. Hole Terminated due to depth. Hole terminated due to "Refusal"
Information provided by the Tennessee department of Transportation, from on-site auger drilling logged by geologist Larry Bolt. All plotted relative to a diagram of the planned excavation.